Anorexia nervosa and bulimia nervosa are the most common clinically recognized eating disorders. Those with anorexia have a tendency to skip meals, adopt highly restrictive and unhealthy diets, obsess over thinness and food, and present abnormal eating habits or rituals. Bulimia presents itself in the form of binging, or overeating, followed by purging, often either by vomiting or using laxatives. It is possible for a person to suffer from both disorders, simultaneously; one may also suffer from body dysmorphia and see herself as being "fat," even when extremely underweight. There is no clear cure for either disorder, both of which primarily affect young women, but treatment is available and can result in full recovery for some. Ongoing treatment efforts and awareness are necessary to maintain health. Eating disorder wherein sufferers fear weight gain and avoid eating as a result. Mainly affects young women. Eating disorder wherein sufferers go through a cycle of binging (overeating) followed by purging, due to a fear of weight gain. Mainly affects young women. Obsession with food, weight, and a "thin" body image; extreme fear of weight gain; compulsive exercise; depression and anxiety; low self-esteem; body dysmorphic disorder. Obsession with food, weight, and a "thin" body image; extreme fear of weight gain; compulsive exercise; depression and anxiety; low self-esteem; body dysmorphic disorder. Usually extremely underweight and unhealthy figure; physical weakness, deterioration, and organ dysfunction; absent menstruation; memory loss, feeling faint, etc. Many within "normal" weight range for height/age, but can be underweight; physical weakness, deterioration, and organ dysfunction; absent menstruation; memory loss, feeling faint, etc. Noticeable oral/dental deterioration. Avoids eating, frequently goes on fasts or restrictive diets, tendency to be secretive about eating habits and rituals. Goes through periods of binging — overeating — and purging, usually by vomiting or heavy use of laxatives, diuretics, etc. No official cause. Can be related to culture, family life/history, stressful situations, and/or biology. No official cause. Can be related to culture, family life/history, stressful situations, and/or biology. May require hospitalization. Outpatient or inpatient treatment options. Dietitians, doctors, therapists, and psychiatrists often part of treatment. Unlikely to require hospitalization. Outpatient or inpatient treatment options. Dietitians, doctors, therapists, and psychiatrists often part of treatment. Varies. Slight majority who seek treatment report full recovery in years to come; up to one third still affected or struggle with relapses. One of the deadliest mental disorders. Varies. Slight majority who seek treatment report full recovery in years to come; up to one third still affected or struggle with relapses. 2 What Causes Eating Disorders? In many cases, the behavioral, psychological, and physical characteristics of anorexia are more obvious to outsiders than the characteristics of bulimia, which are often subtle. However, it is common for there to be overlapping symptoms between the two disorders. Body dysmorphic disorder (BDD), which affects one's ability to see the body as it truly appears; often causes one to think she is "fat" and/or oddly-shaped. Symptoms for anorexia and bulimia differ in terms of how those with these conditions relate to food and what ritualistic behaviors they exhibit. Relationship to food: People with anorexia usually avoid eating, go on restrictive diets or lengthy and frequent fasts, and hesitate or delay eating even small portions of food, while people with bulimia go through periods of binge eating and periods of purging. In other words, an outsider may see evidence of excessive eating habits in the case of bulimia — e.g., buying lots of food and eating it in a very short time — but evidence of undereating in the case of anorexia — e.g., buying little food, and then not even eating that small amount. Those with bulimia are more likely to employ the frequent use of diet pills, diuretics, laxatives, and/or enemas to lose weight, but anorexia sufferers may purge in this way as well. Ritualistic behaviors: Except in cases where a person suffers from both disorders, someone with anorexia alone will not binge eat at all and will not necessarily go through the excessive purging stages that a person with bulimia will. 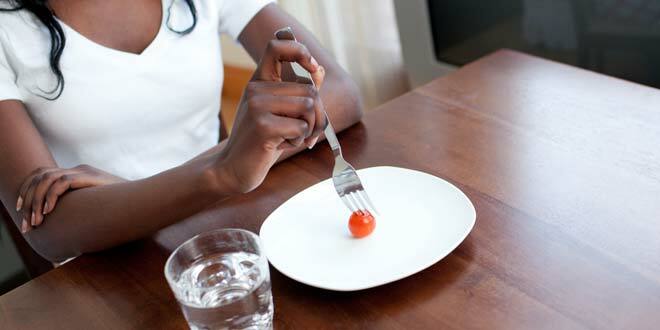 In anorexia, a person tries to avoid food altogether. This usually results in a number of odd and strict rules about when, where, what, and how to eat, with many hiding their dietary habits from others and avoiding eating altogether. A common behavior seen in those with anorexia is the tendency to move food around on a plate, or cut it into small pieces, without ever actually eating. Those with bulimia will often exhibit near-normal dietary habits, but will use the bathroom directly after eating (often to force vomiting). It is common for those with bulimia or anorexia to be unwilling to admit they have a health condition. This can even blossom into support for anorexic or bulimic behavioral traits, as is sometimes seen in "pro-ana" communities, where there is "thinspiration" (idolizing thin, skinny, and unweight bodies) and anorexia is personified ("Ana"). When it comes to those who suffer from one, rather than both, of these illnesses, there are markedly different associated physical characteristics. There is some correlation with age (though not causation). Bulimia tends to develop in older teens and young adults, whereas anorexia is generally seen in younger teens who are going through puberty. However, these are just the most common age groups affected and diagnosed; both eating disorders can occur at any age or stage of life. Anorexia, more than bulimia, is likely to result in an extremely underweight and unhealthy figure, but a low body weight is possible in both conditions. Bulimia is most often associated with a normal a weight, but this does not mean the disorder is less serious overall. While physical weakness, deterioration, and organ dysfunction are usually worse in cases where lots of weight has been lost, a number of negative physical symptoms arise, regardless of weight, due to the unhealthy habits associated with these eating disorders. In both conditions, anemia, dehydration, low blood pressure, muscle fatigue, irregular heartbeat, vitamin and mineral deficiencies, kidney problems (e.g., stones or even failure), gastrointestinal pain and/or bowel irregularity, hormonal disruption (e.g., amenorrhea, or absent periods) and reproductive problems (e.g., miscarriage), and skin conditions are all common symptoms. In anorexia, there is also hair thinning or loss, and in bulimia there are a number of oral and dental indicators related to vomiting (e.g., cavities and tooth enamel loss due to frequent exposure to stomach acid). 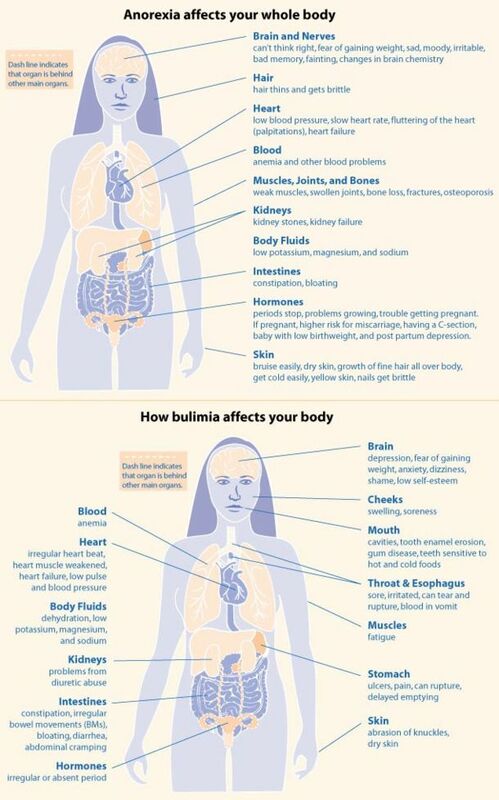 Bulimia and anorexia also negatively affect brain and nervous system health, particularly in cases where an extreme amount of weight has been lost. Weight loss can exacerbate the depressive and anxious feelings that are often associated with these disorders. Experiencing memory loss, going through mood swings, and feeling faint are all common physical symptoms. Comparing the different physical symptoms of anorexia and bulimia. Images from WomensHealth.gov. Doctors do not yet know what causes eating disorders. However, anorexia and bulimia have known associated risk factors. Culture may play a significant role in the development of eating disorders, which seem to be more common in nations where media and advertising focus on beauty, "perfection," and even weight loss — usually to target a wholly different demographic: those who are obese. Families are an important factor in anorexia and bulimia. Many who struggle with anorexia or bulimia had a parent who also struggled with the disorder(s), or they had a parent who placed a high priority on physical beauty or criticized their physical appearance when they were younger. Stressful events, particularly when coupled with a "high-strung" or perfectionist personality in someone with low self-esteem, can lead to the development of eating disorders. The stress of puberty and growing up seem to be common factors in anorexia and bulimia. Biology, including genes and one's chemical and bacterial makeup, may ultimately be the biggest factor, but research is ongoing. In 2014, researchers discovered an bacterial protein in the intestines which can trigger or inhibit a feeling of fullness in the brain. Learning how to target this protein and manage its activity may open the door to medications that can treat anorexia and bulimia. As weight loss is common to numerous other illnesses, diagnosing anorexia and bulimia can be difficult in some cases. For this reason, doctors will often need to thoroughly examine patients and run a series of blood tests to properly diagnose these disorders and figure out a course of treatment. Diagnosing anorexia in cases of extreme weight loss is easier than in cases where only slight weight loss has occurred. Bulimia is easier to diagnose due to the obvious oral/dental symptoms associated with the disorder. Due to bulimia being associated with average body weight, it is rare for this disorder to call for hospitalization. Anorexia, however, frequently lands sufferers in the hospital over time, as organs are prone to malfunction or fail as one loses abnormal amounts of weight. Treating bulimia and anorexia can be difficult and, in some cases, impossible, and it appears that the age of onset and diagnosis is important. Many who have an eating disorder will not acknowledge and admit that they have an eating disorder. This makes anorexia and bulimia difficult not only for those suffering from the disorder, but also for their friends and family. In cases where a person is open to receiving treatment, there is hope to be found in a variety of outpatient and inpatient care facilities. Treatment teams consist of dietitians, doctors and psychotherapists who specialize in eating disorders, and occasionally psychiatrists who may prescribe antidepressants or anti-anxiety medications. Cognitive-behavioral therapy is a popular method of therapy for treating these disorders, as changing how one thinks about weight and food is a primary goal. Treatment tends to also include more healthful coping mechanisms for handling stress and triggering subjects. The long-term prognosis for both disorders varies. While the majority of those who have sought treatment report moderate to complete recovery a number of years later, a significant minority (~10-30%) still struggle with symptoms and even relapses. Among those who struggle the most, suicide is common. Anorexia is harder to treat than bulimia. Roughly 20% of those who diagnosed with anorexia are dependent on social services. Worse, it is a very deadly disease, with one of the highest mortality rates among mental disorders. In a 21-year follow-up study, nearly 16% of the study's participants "died from causes related to anorexia nervosa." While both eating disorders can affect both sexes and all ages and races, they are more commonly diagnosed in young Caucasian women. At least one study has suggested racial differences have had more to do with racial prejudices affecting diagnosis, but further research is required. 90-95% of all those first diagnosed with anorexia or bulimia are young women between the ages of 15 and 24. Bulimia, affecting around 1% of young women in the U.S., is more common than anorexia, which affects 0.3%. Body dysmorphic disorder, which is sometimes coupled with one or both of these disorders, is nearly as common in men (2.2%) as it is in women (2.5%). Why are there so few references to Black Americans and struggles with Anorexia and/or Bulimia. At 42 I struggled most of my teen years with anorexia and was hospitalized for it, at 40 I crashed after my daughters went to college and the old problem reared its head along with all of the issues that made it appear in the beginning which had nothing to do with wanting to be thin, but invisible because of human trafficking that was and continues to be ignored in my community. Isolation leads to survival and a lack of understanding leads to exorcism where everyone thinks you have demons. Therapists are fine but awed with all of the personal accomplishments that mask the pain. I can only revert back to what helped as a child. It's devastating that our society today goes through these psychological disorders. Being thin is definitely not a sign of attractiveness. Please don't let these gruesome diseases rule your life. Sure, as a guy, I find smaller/thinner girls more physically attractive. But that by no means I prefer them. Just one of those things in life that'd be kinda nice. Compared to personality, physical appearance doesn't matter much. So it's not really that big a deal to me. If you think that you have to wreck your body to be attractive, then you don't understand one of the most simple facts in life; the vast majority of guys don't really care.